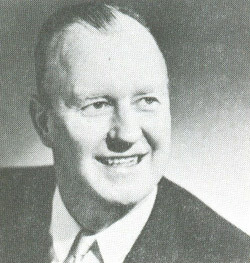 Jack Brickhouse, a broadcaster best known for covering Chicago Cubs baseball, also covered many other sports and teams and did a significant amount of non-sports broadcasting, including coverage of several national political party conventions, and interviews with four U.S. Presidents and Pope Paul VI. “My father ran the gamut of the entertainment world,” wrote Jack Brickhouse, of his father John William “Will” Brickhouse. “He was a sideshow barker. He was buried alive. He was a carnival man’s carnival man.” He also was credited with originating “split-week vaudeville,” and was a booking agent for motion pictures. Jack’s mother, Daisy James Brickhouse, was a Welsh immigrant who worked as a hotel cashier and hostess. Jack was born January 24, 1916, in Peoria, Illinois. An only child, his father died when he was just three years old. Though his mother remarried, to Gilbert Schultze, Brickhouse grew up in a household where every penny was needed. After school at Lincoln Grammar School, Brickhouse would often help his grandmother deliver food trays at Proctor Hospital, in order to have access to a little extra food. Brickhouse also demonstrated his entrepreneurial streak as a newspaper vendor and golf caddie. While attending Peoria Manual Training High School from 1929-33, the gregarious Brickhouse played basketball, served as a reporter and editor for the school paper, was elected senior-class vice president, qualified for the National Honor Society, and played the lead in the senior class play. In the fall of 1933, Brickhouse enrolled at Bradley Polytechnic Institute (now Bradley University) in Peoria, hoping to become a lawyer. The six-foot-three youngster played on the freshman basketball team, but he had to leave college late in 1933, due to a lack of funds. While working at a distillery, Jack entered an announcing contest held by local radio station WMBD. Though he didn’t win, he accepted a job as a half-time switchboard operator, and the other half of his time was spent on the radio, announcing news, weather, barn dances, variety shows, and local sports. He became known for his “Man on the Street” interviews, approaching pedestrians for comment on issues of the day. During the 1937-38 season, Brickhouse convinced WMBD to broadcast Bradley Braves basketball games. The Bradley team was a national contender, and compiled a 52-9 record from 1936-39. Brickhouse accompanied the Braves on the road and broadcast the first two National Invitational Tournaments from New York’s Madison Square Garden. He also covered Big Ten football, minor league baseball, boxing, and initiated shows of his own, such as “Here’s How They Did It,” a series of interviews with successful businessmen. On August 7, 1939, he married Nelda Teach of Avon, Illinois. In the Spring of 1940, Brickhouse was hired by Chicago’s WGN as an assistant to legendary broadcaster Bob Elson. He helped out on Cubs and White Sox broadcasts, broadcast big band concerts, and continued his “Man on the Street” interviews. That fall he began broadcasting Notre Dame football. Brickhouse caught a break in midsummer, 1942, when Bob Elson joined the Navy. Brickhouse finished out the baseball season doing both Cubs and White Sox games. When neither team was at home, Brickhouse would recreate the away games from ticker-tape accounts. Brickhouse himself joined the Marines after the 1943 baseball season, but was discharged two months later due to complications of childhood tuberculosis. In 1944, WGN took a pass on baseball, and Brickhouse found himself covering the first of many Republican and Democratic national conventions. The next January he was in Washington to cover President Roosevelt’s inauguration. He covered White Sox games for WJJD in 1945 until Elson returned from the Navy. In 1946, Brickhouse journeyed to New York to broadcast New York Giants baseball on WMCA. “Anybody who could see beyond his nose knew that television would be important someday,” Brickhouse reminisced, and so he returned to Chicago to experiment with baseball coverage on TV station WBKB in 1947. That same year he became the radio voice of the Chicago Cardinals professional football team. He rejoined WGN in 1948 as sports service manager and broadcaster. The station covered all Cubs and Sox home games, with Brickhouse as the broadcaster. According to historian Curt Smith, Brickhouse and WGN “began a continuum--an intimacy between ball club and viewer--that decades later, in the wake of cable and thus, WGN’s intrusion into millions of American households, fostered for the Cubs an enormous national sect.” WGN had played a pioneering role in radio broadcasting of baseball, at a time when team owners worried that broadcasts of games would hurt attendance, and they took the same role with the new medium of television. During the late 1940s, Brickhouse continued doing Cubs and White Sox baseball and professional and college football. Still a “Jack of all Trades,” he also originated a radio show called “Marriage License Romances,” in which he interviewed couples applying for marriage licenses at City Hall. On the Cubs opening day in 1949, his only child, Jeanne, was born. Starting in 1948, and continuing for nine years, he also broadcast professional wrestling, an assignment he initially disliked, but came to see as theatrical entertainment. The 1950 season saw Brickhouse cover his first of five baseball All-Star Games, this time as the national announcer for the DuMont network. During that same year, he began publishing the annual Jack Brickhouse’s Major League Record Book, helped to pioneer televised golf, and was on the national broadcast team for the first of four World Series. From 1953 through 1976, a period of 24 years, Jack was the radio voice of the Chicago Bears NFL franchise. In 1962, a portion of a Cubs-Phillies game with Brickhouse at the mike was included in the first satellite television broadcast to Europe. In 1963, Brickhouse began several years of writing the “Jack Brickhouse Says” column for the Chicago’s American newspaper. In 1964, he was elected to the Cubs board of directors, resigning in 1975 to forestall any concerns about his journalistic objectivity. Brickhouse broadcast his last White Sox game in 1967, when the team transferred to another station, and began doing all Cub games, both home and away. In 1971, he narrated the successful “Great Moments in Cubs Baseball” record album. In 1975, with the White Sox in danger of leaving Chicago, Brickhouse helped assemble investors for an ownership group headed by Bill Veeck which kept the team in town. Jack and Nelda Brickhouse divorced in 1978. In 1979, he broadcast his 5000th baseball game, thought to be many more than any other announcer at the time. He married Patricia Ettelson on March 22, 1980. He retired from Cubs baseball in 1981, though he remained at WGN in a vice-presidential capacity. In 1982, the Wrigley Field broadcasting booth was named in his honor. Though he was eventually named to ten Halls of Fame, his selection as the 1983 recipient of the Ford C Frick Award, given by the National Baseball Hall of Fame for career excellence in broadcasting, was a personal pinnacle. Brickhouse’s legacy in baseball broadcasting is of having carried the flag for WGN as it established itself as the first cable superstation and televised almost all Cubs games from the 1950s through the 1990s. His voice was well known in Midwestern households from the mid 1930s to the early 1980s, and his famous home run call of “Back, back, back...Hey Hey!” is still remembered fondly. The only criticism of Brickhouse is that he was a bit too positive, cheerful, and optimistic for some viewers, sugar-coating a parade of terrible Cub teams throughout his career. “I like some Gee-Whiz enthusiasm in broadcasting sports,” Brickhouse said. Brickhouse died on March 3, 1998, of cardiac arrest, following surgery to remove a tumor in his brain. He was 82 years old. Note: A version of this biography originally appeared in Scribner's Encyclopedia of American Lives. Jack Brickhouse’s autobiography, Thanks for Listening!, was published by Diamond Communications of South Bend, Indiana, in 1986. The book is a substantial source of information on his career, though it can be critiqued in the same manner as his broadcasting style; there’s no “juicy stuff.” Brickhouse has nary an enemy and never seems to have had a bad day at work. Many disagree with that criticism, and laud his relentless good cheer and optimism. The title of his autobiography, and its exclamation point, underscore his personality. Janice Petterchak published a biography of Brickhouse in 1996 entitled Jack Brickhouse: A Voice For All Seasons. (Chicago: Contemporary Books). Well researched and written, the book serves not just as a biography, but also as a history of early Chicago broadcasting, which, with the later rise of Cable TV, essentially served as a template for sports broadcasting in general in later decades. As it does with most important baseball figures, the National Baseball Hall of Fame’s Library maintains a biographical clipping file on Jack Brickhouse which is well worth consulting. Among other things it contains his New York Times, AP, and USA Today obituaries.